Grains mixed in the overnight. Beans up 5 cents, wheat down 3 ¾ cents and corn down 2 ½ cents. Early estimates on today’s U.S. weekly export inspections are 15 mil bu wheat, 50 mil bu of corn, and 45 mil bu of soybeans. U.S. corn harvested estimates are running around 87% complete, soybeans 93% with winter wheat conditions seen unchanged to down 1% in the good to excellent category (plantings have been running behind average). On-going trade talks between the U.S. and China will persist as time ticks shorter to the G-20 Summit. These continued discussions could smooth relations by November. Corn prices traded lower overnight, in a 1½ cent trading range, on spillover weakness in the wheat market. Harvest activity plugs along this week as the weather is cold enough for the combines to roll across the fields. An Iraq official will meet in Russia to discuss wheat quality issues and determine whether or not the condition of the wheat are above expectations. The majority of Iraq’s wheat imports currently come from the US, Canada and Australia. The USDA came out with the largest November corn yield reduction (-1.8 bushels per acre) since 2006; among the last six Nov corn yield reductions of 1.5 bpa or more (back to 1993), yields fell again by January ”final” in all six seasons, to an average of –1.5 bpa as well. 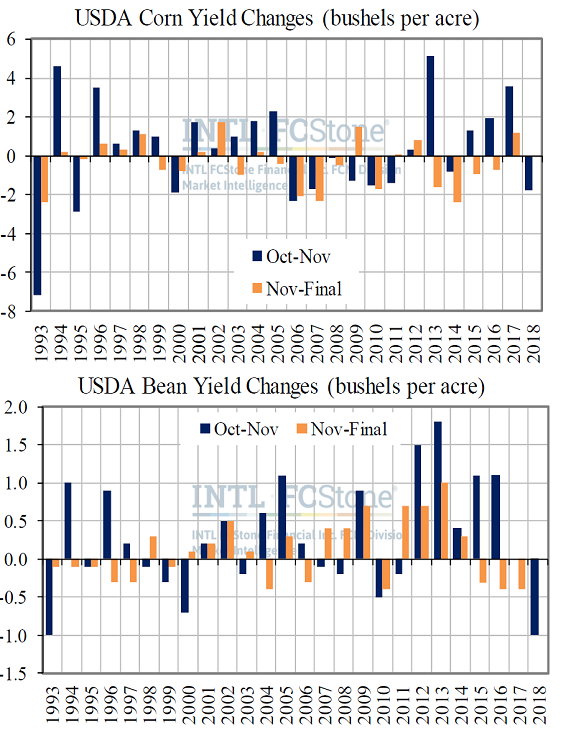 Speaking of 1993, the even bushel per acre soybean yield loss this month was the largest since that infamous year; however, of the eight instances in the last two decades where yields fell in Nov, that was followed by another Jan/final loss just twice.